Hand Lettered Watercolor Print - Free Download! 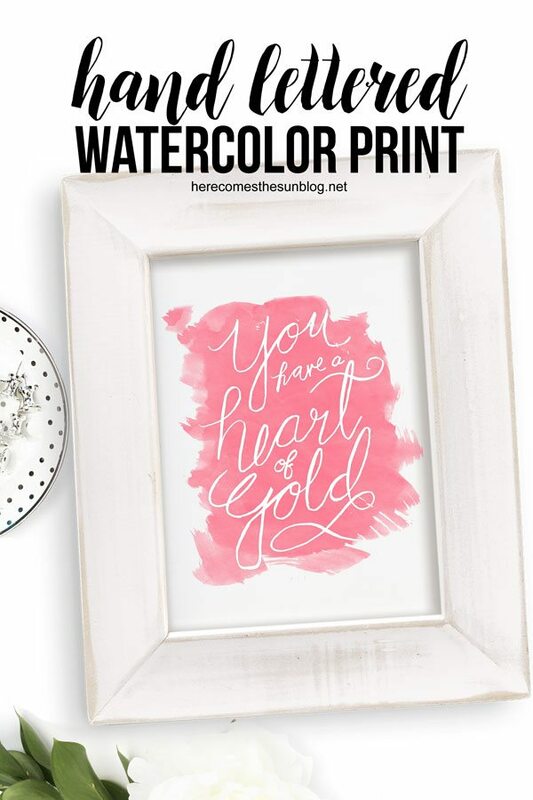 This hand lettered watercolor print will guarantee that you rise to the top of the “favorite child” list on Mother’s Day. I’m in love with watercolors. They are soothing, tranquil and make every worry melt away when I look at them. Didn’t know watercolors could do that? Try looking at them and then try to be in a bad mood. It’s just not possible. For this watercolor print, I hand lettered a quote that is perfect for Mother’s Day (or any day really). Then I took my hand lettering and with the power of Photoshop, I turned it into a beautiful print that you can download and give to that special mom in your life. I created one print with black text and one with white text so you can use whichever one you like best. Please note that this printable is for personal use only. It may not be sold or redistributed. If you want to share this with your friends, please direct them to this post so they can download their own copy. This print is 8×10 and is formatted as a PDF file. Place this print in a frame and you have the perfect Mother’s Day (or any day) gift.